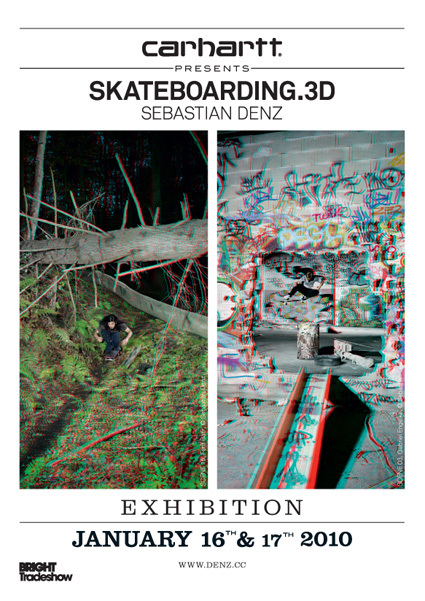 10th ANNIVERSARY ISSUE OF THE BRIGHT TRADESHOW FEATURING SKATEBOARDING.3D BY SEBASTIAN DENZ 16.01. &amp; 17.01.2010! The show is open daily from 10:00h to 18:00h, you’ll find us on the ground floor in booth no. 45! Apart from being able to peek at the upcoming Carhartt gear you’ll be able to dive into the magic of SKATEBOARDING.3D by Sebastian Denz. The exhibition features an impressive set of 180cm sized prints, which reveal the amazing quality of the 3D images that Sebastian produced with his custom stereo-big-format camera. You’ll be able to meet the man behind the lense(s) as well, Sebastian will be around both days!! Furthermore, our friend, artist, gallerist, skateboarder Sergej Vutuc will be present with his “BASEMENTIZID“ room, details about Sergej’s exhibition will be posted right here soon! For those who’ve never been there, the Bright is Europe’s only tradeshow fully dedicated to skateboarding. The show takes place in the “Friedrich Ebert Anlage II”, a former police station located right next to the train-station in the very center of Frankfurt am Main/ Germany. The three-level-building with a giant patio is a perfect location for a skateboard tradeshow, apart from the individually styled rooms of the brands you find an indoor bowl, numerous exhibitions and a lot of happenings like live music, film premieres etc. Check right here to get an idea of how the place looks. For more infos and an online version of the show’s magazine check www.brighttradeshow.com.? BASEMENTIZID - NORMEN STOLL "WITHOUT GOOD PICTURES" 16.01. - 06.02.2010!